Organic skincare ~ can actually make you happy!! When you choose good organic skincare, you are choosing products whose ingredients work in harmony with the natural systems of your skin. Given the right nutrients, our skin has the ability to care for and repair itself. Our bodies use nutrients absorbed not only through food, but also through the skin. Around 60% of the products that we put on our skin are absorbed into our bloodstream ( more so with babies and children ) and since we are now all more educated about what we put into our bodies, we should pay more attention to what we put ON them too. High quality Organic skincare is a complete package, it works on the outside AND the inside, and a healthy inside is reflected in our skin. Many modern products, mass produced for affordability, have great results, but they also carry a heavy chemical load, man made chemicals, synthetic fragrances and cheap ingredients, all applied to our skin, slowly absorbed into our systems. They make the outside look OK but are doing nothing for us on the inside, in fact they are increasing the levels of waste our bodies have to process and eradicate, they are making our systems work harder. In a time where levels of serious illness such as Cancer, Diabetes, Fibromyalgia and chronic fatigue are on the increase, people are becoming more aware of our environmental stresses and the effects these have, and are returning to more natural choices for many things. I am often asked why I have always chosen Organic, natural products for my treatments. My answer, as always is, they work. They work better, faster and harder and produce incredible results. Many years ago a skin expert taught me that your skin can’t tell the difference between a plant cell and a one of it’s own cells, and so using natural plant derived ingredients on your skin means that they will be accepted by your skins defense systems and start working faster than any synthetic ingredients. Essential oils are the fastest working example of these, they drop straight through into the blood stream and start work immediately. As an added bonus, essential oils not only treat your skin but they work on a mental and emotional level too, uplifting, relaxing, calming or invigorating, your skincare can actually make you happy and de-stress you! 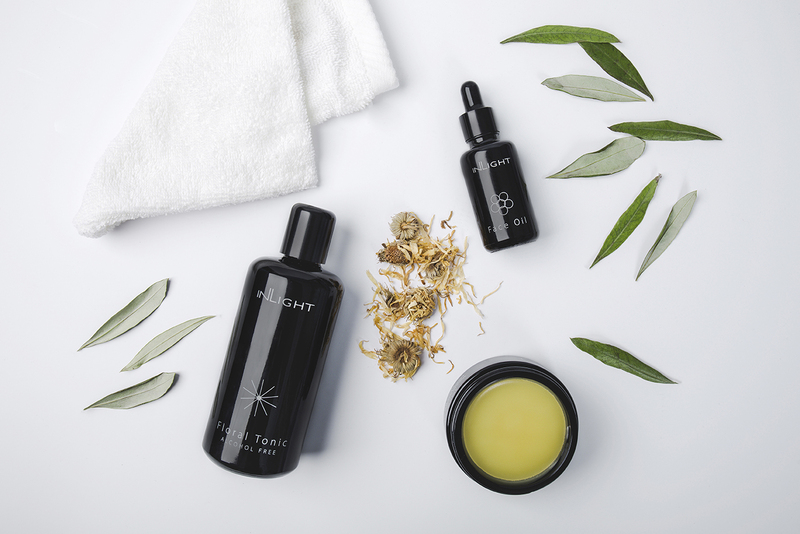 So logically, the more natural ingredients in your skincare, the higher the level of organic content, the better it is for you and the more effective it will be. Which is why, after a lot of searching I finally found exactly what I was looking for ( and more ) for my choice of Organic skincare for my treatments ( and for my own use too! ) . I not only wanted something effective and Organic, but something luxurious, that felt as special as it is, that I would be proud to put into my therapy studio and also on my bathroom shelf. I love beautiful things, and only one range fitted the bill. Their products are a glorious array of fragrant, luscious oils, balms and masks, in beautiful Violet glass jars and bottles, no one can resist them, they look and smell divine. As a therapist I could not ask for more from my skincare range. The results are instantly obvious to clients, their skin glows and has a radiance with just one treatment. The products feel rich, indulgent, smell incredible and the whole treatment becomes a sensory experience. Clients leave feeling like they have had more than just a facial treatment. My clients love everything about the products. ” They look beautiful, they smell gorgeous, they are easy to use and they give great results “. A simple 3 step ritual daily at home leaves you glowing and feeling confident. After just one use of the Superfood mask I went out barefaced, not a scrap of make up because my skin looked and felt too good to hide it! So my recommendation is, swap your skincare for something natural and Organic, reduce your chemical load, choose carefully and enjoy the results, create a ritual for yourself, love yourself and the skin you’re in. Your skin will thank you in return.